Kyle Keller is a three-time qualifier for the Ohio High School Athletic Association state wrestling tournament and two-time all-state performer. And the 17-year-old Delta High School junior credits a busy off-season, including competing in the National United Wrestling Association for Youth (NUWAY), for helping him excel on the mats in one of the toughest states for high school wrestling. Keller also remembers his last NUWAY tournament wrestled — that came in the NUWAY National finals last month at Battle Creek, Michigan’s Kellogg Arena. He won a national title by wrestling his way through a tough Division 7 122-pound bracket. And that is why Keller says wrestling in NUWAY with the competition from top-level wrestlers from other states has helped improve his skills on the mat. It’s that reason NUWAY president Dave Dean and Roger Chandler have put so much effort into building this association of folkstyle wrestling to what it has become today. Dean and Chandler started the idea in the state of Michigan, but NUWAY has grown into a national association which has 12 active states, and 22 total, competing in state and regional-level events. Caiden Hart (right) of Ohio lost a first-round match, but came back to win three consolation bouts and finish sixth at 62 pounds in Division 3 of the 2013 NUWAY Nationals in Battle Creek, Mich.
And at this year’s nationals, 1,009 wrestlers competed in seven divisions, the most in the five years of the national tournament. OURWAY director Randy Hartman loves how NUWAY has grown, especially the tournament. 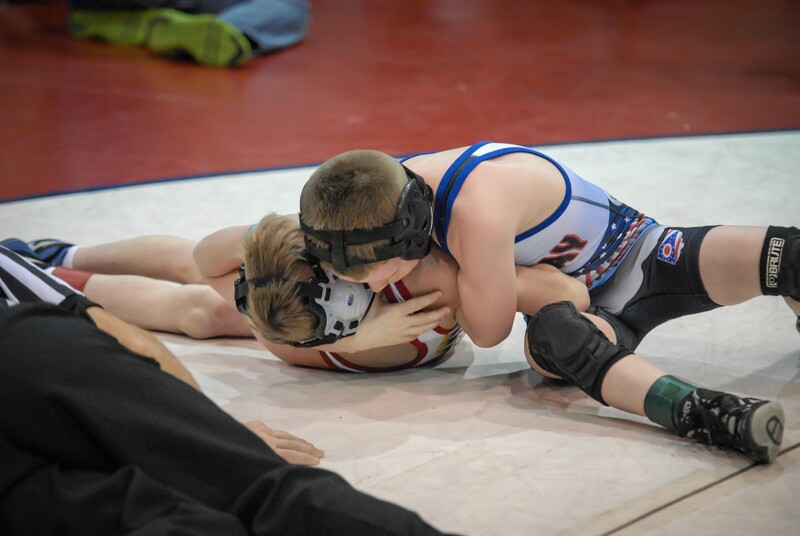 This year, Ohio had over 1,200 wrestlers wrestle in its OURWAY tournament. Dean hopes to have those kinds of numbers throughout the country, giving kids all around the country the ability to compete in the great sport of wrestling. Keller gives it his stamp of approval.